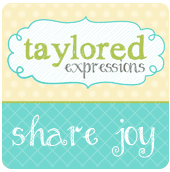 My card today is part of the Taylored Expressions Share Joy campaign that was launched in March of this year! It is the third phase of the campaign that is partnering with the Spiritual Care Department of the Unity Point Health System in Des Moines Iowa - who provide support to families whose loved ones pass away while in their care. The team has discovered that sending cards to the families significantly improves their ability to grieve in healthy ways and so if you would like to be part of this campaign - please send your Thinking Of You cards to Taylored Expressions by May 8th, 2015. 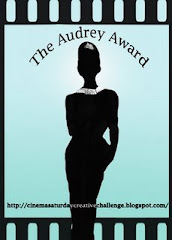 For more information about this campaign and the GRAND PRIZE that is also involved - please check out this page on the TE webpage! I used the sentiment "Thinking of You" from the Love Grows Here stamp set. I kept the color palette simple and neutral with small pops of the Lilac Posie for color. 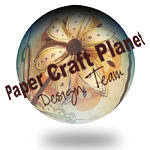 The background was embossed with the Woodgrain embossing folder. Sometimes when I am thinking of someone or holding them in prayer - I tend to be gazing outside - so I used the Arch Window die to die cut the window and then combined it with the Arbor Accessories and the Wispy Grass die border. I love the feel of the all white wood grain and flowers around the window - it makes it feel like from a fairytale. I just love how this card turned out - it has such a whimsy feel for me - and this is campaign is such a positive and uplifting campaign that touches people's hearts in little ways that make a big difference. Sweet Sunday Sketch #262 - Thank You! 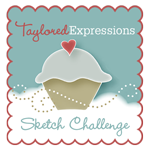 Sweet Sunday Sketch #260 - Congratulations! Mojo Monday #387: I Love You more than Chocolate!